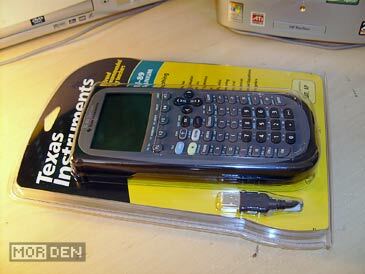 Recently, I acquired a new graphing calculator by Texas Instruments. 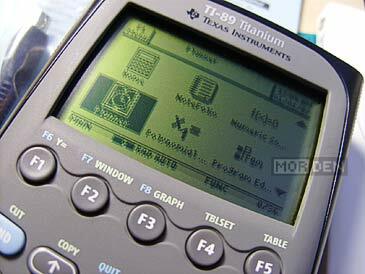 Few weeks back I was considering a purchase of a TI-84 Plus Silver Edition, because the Titanium was way too expensive for my taste - the cheapest one I found online was selling for $342. After checking out some local stores I decided to dig around the internet for the cheapest place to get one, and that's when I found the Titanium on Amazon. 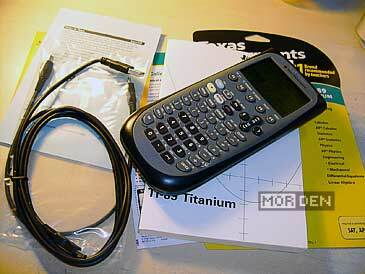 The TI-84 Plus Silver Edition was selling for $174, so imagine my surprise when I saw a much superior TI-89 Titanium on sale for $139. I had no choice but to grab it while I still could. The tricky part was, Amazon charges plenty for shipping to Europe, and a package would certainly be intercepted by customs. This would mean I'd have to pay customs 20% of the price, plus 25% tax. I didn't feel like throwing my money away, so I asked my friend DJGeki of Cryptic Allusion to buy it for me and send it to me as a gift. Amazon doesn't charge for the shipping within the US, by the way. 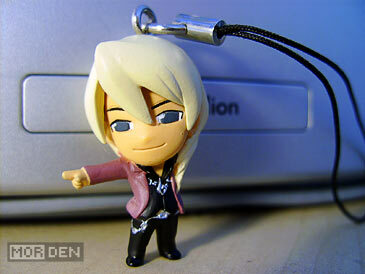 This way, I have managed to get what I wanted and I ended up saving $175. A graphing calculator might not be the best topic to discuss on a blog focused mainly on gaming, but it just so happens that there are a lot of games written for these calculators, as well as scene demos. There's even a Game Boy emulator, which thanks to the calculator's Motorola 68000 running at 16 MHz, a 160×100 display and tons of memory, is a pretty decent alternative for those, who can't live without games, but won't dare to pull out a real Game Boy during class. Another cool feature is the 3D graphing, which is probably the only visually interesting function of the calculator, so here's a sample video. If you can't be bothered with a Nico account, go here and click play. If the calculator wasn't enough, when I opened a package I found some additional gifts from DJGeki and his wife Pam. 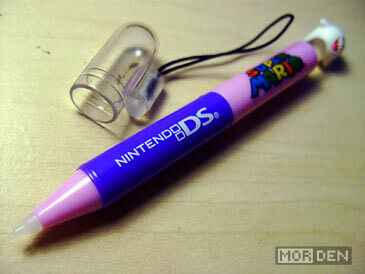 I got two gashapon capsules, one containing a Super Mario stylus for the Nintendo DS, the other a Gyakuten Saiban 4 [逆転裁判4] super deformed figurine of Garyū Kyōya [牙琉 響也]. 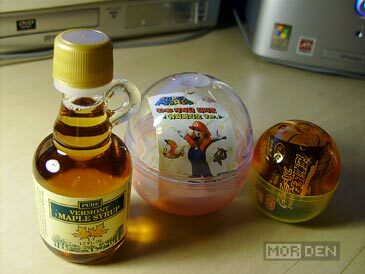 On top of that, I got a small bottle of maple syrup which, up until now, I have never tasted. I always imagined that maple syrup's taste would be somewhat similar to honey, partially because of the obvious visual resemblance, and because I knew it was sweet and thick. The real taste is hard to explain. It is honey-like, but it has a hint of coffee syrup and malt somewhere in the background. I'll cook up some pancakes soon and we'll see how well these two go together. So thanks again to DJGeki and Pam for supplying this delicious treat. Maple syrup is kind of hard to come by here, and I was told to stay away from the so called "pancake syrup", which doesn't have an aounce of maple sap in it. It's always fun to try new things, especially when they're this tasty. Before I go, I'd like to ask everyone to come by the Cryptic Allusion forums and check out the CryptoCast section. There's a new podcast recorded every other week, which you can both download from the forums or participate in on Justin.tv. Follow DJGeki's Twitter to get the broadcast time and date or register on Justin.tv and subscribe to the channel. You'll get a broadcast start notification via email. That's it for now! Cheerio! 2009.09.21 Mon Random and ♥Hate♥ Comment Tweet This!